Job seekers can send in a Union Pacific application for a chance to work for one of the most successful railroad companies in America and the entire world. Founded back in 1862, Union Pacific Railroad currently operates over 8,500 locomotives and as many as 32,100 route-miles in 23 states. It is the largest railroad transportation companies in the United States and it is mentioned on the prestigious Fortune 500 list. According to the company’s hiring policy, all candidates for Union Pacific employment must be at least 18 years old to be considered eligible for the available careers. Please note that all younger candidates will be automatically eliminated from the hiring process. Company policy dictates that all candidates for Union Pacific employment must send their applications online to be considered for their chosen positions. When they find a career that they would like to apply to, they will be asked to create a profile on the employment portal. To do this, they will have to submit their e-mail addresses and access the profile creation confirmation link that will be sent to them via e-mail. Then they will have to provide their contact information and secure their accounts to complete the process. Once they finish this, they can begin filling out the Union Pacific application form, which we will describe in the following section of our article. This is the first section of the Union Pacific Railroad application form. 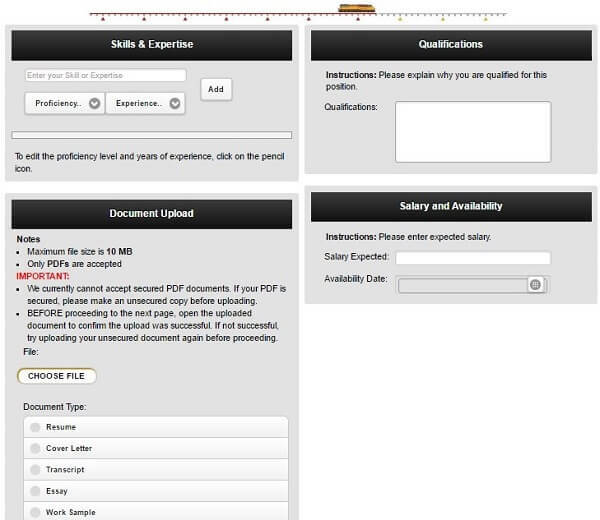 Candidates may upload their resumes to use the data-fill tool available on the portal. Please note that this tool is entirely optional. Candidates may opt to fill out their forms manually. 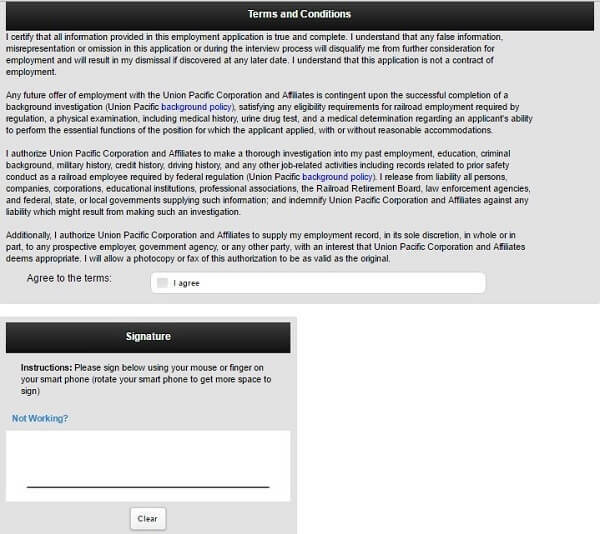 For this section of the Union Pacific Railroad application form, candidates may provide their contact information. The Human Resources specialists will use this data to identify them and to contact them in regards to their hiring status. For this section of the Union Pacific Railroad application form, candidates must fill in two short questionnaires meant to assess if they are able to comply with the requirements of their chosen positions. Company Questions – This questionnaire is targeted to assess if candidates are able to meet the employment eligibility criteria enforced by the company. Position Specific Questions – This questionnaire is specific to the Union Pacific careers chosen by the candidates and features questions about their relevant academic and professional experience. For this section of the Union Pacific Railroad application form, candidates are required to provide details about their education background. They may include the relevant programs they have completed in reverse chronological order to convey an overview of their experience. For this section of the Union Pacific Railroad application form, candidates must provide information about their professional experience for the last four years. They must list the positions they have had in reverse chronological order. They will also be asked to provide an explanation for each employment gap they may have had throughout their experience. Solicit an Employee Referral – Candidates may solicit a referral from a UP employee by filling out the form featured here. License and Certification – Applicants may provide details about any licenses or certifications they may have acquired throughout their careers. How did you hear about this job? – The Union Pacific application portal requires candidates to mention how they have heard about the positions they are applying to. This will help them improve their communication with job seekers. 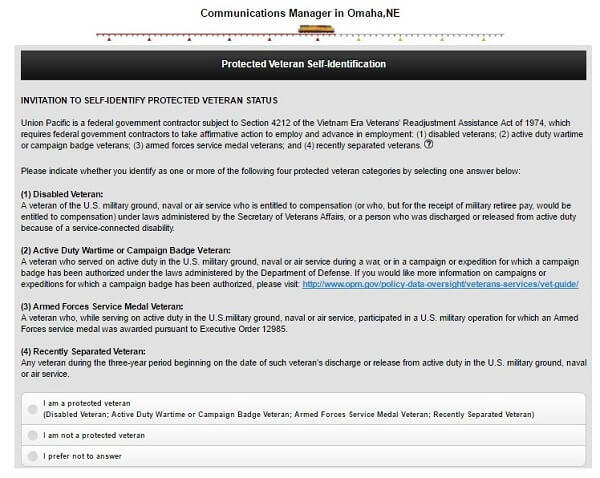 Military History – Candidates may include details about their military history for this section of the Union Pacific application. Please note that they are not obligated to disclose this type of details unless they are entirely comfortable doing so. This is the first Self-Identification questionnaire featured in the Union Pacific Railroad job application form. Candidates may opt to disclose their veteran status if they are comfortable sharing this type of information with the company representatives. Skills and Experience – Candidates may list their most relevant skills and experience details in this section of the Union Pacific application form. 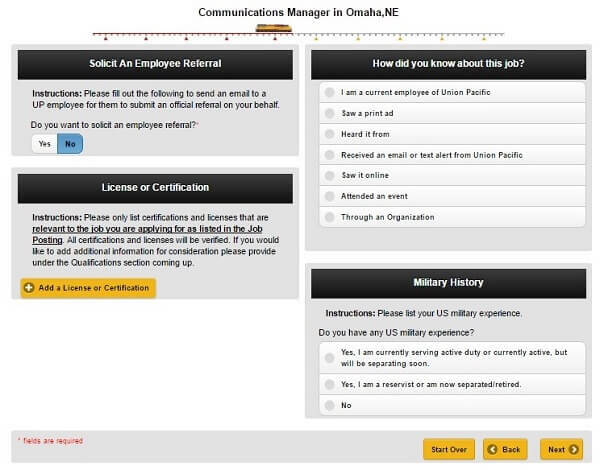 Qualifications – For this part of the Union Pacific application form, candidates are required to provide an answer to a pre-employment question targeting their experience. They will have to explain what makes them qualified for their chosen careers. Document Upload – Candidates may upload the relevant documents that can attest their professional qualifications for their chosen careers. They may provide their resumes, along with all the additional documents they see fit, as well as their cover letters. Salary and Availability – For this section of the Union Pacific application form, candidates may list their expected salary and the date they would be available to start work. For this section of the Union Pacific Railroad application form, candidates may include information about any disability they might be suffering from. They will have to provide their signature and the current date to validate this form. This is the final section of the Union Pacific job application form. Candidates must read the terms and conditions of the portal and provide their signature to certify that they fully agree to these. After this, they can submit their forms to the Human Resources department for the formal assessment. The updated list of available Union Pacific careers can be accessed on the job application portal. Candidates may select the best-suited career areas and location for their needs to find the available positions that are in line with their expectations. Interning for the largest transportation companies in the United States is an important career move for any young professionals. They will get to learn from highly trained professionals and develop key skills that they can later use throughout their careers. Union Pacific salaries for interns range from $16.00/ hour to as much as $23.00/ hour. The exact rates will be negotiated during the interview process according to the specific background of the employee. 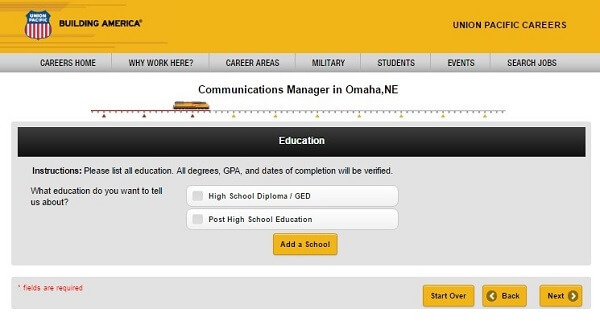 Job seekers aiming for Union Pacific careers in management will find the complete list of employment opportunities on the job application portal. They are required to submit an application online to be considered for the available positions. Health and Wellness Union Pacific Employee Benefits: Medical Plan, Dental Plan, Vision Plan, Health Counseling, Health Assessments, Fitness Services, Smoking Cessation Programs, Life Insurance, Disability Insurance. Retirement and Financial Planning Union Pacific Benefits: Union Pacific Employee Pension Plan, Union Pacific Employee Retirement Plan, 401(k) Plan, Competitive Union Pacific Salaries. Life and Family Union Pacific Employee Benefits: Adoption Assistance Program, Child/ Elder Care Program, GiftPLUS Gift Matching Program. Wellness Programs Union Pacific Benefits: System Health Facility Program, Tobacco Cessation Program, Health Coach, WebMD Live More Portal and Wellness Assessment. Special Union Pacific Benefits: Paid Vacations, Union Pacific Transportation Spending Account, Cycling Benefit, Tuition Reimbursement Program, Union Pacific Employee Discounts. 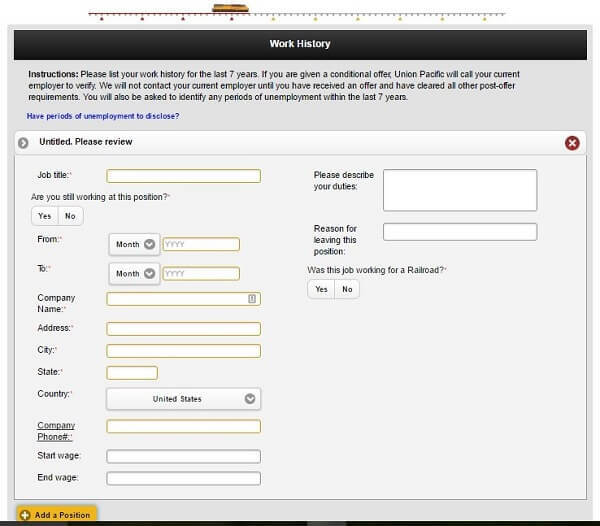 The Union Pacific application form is rather lengthy, compared to other jobs and employment forms. 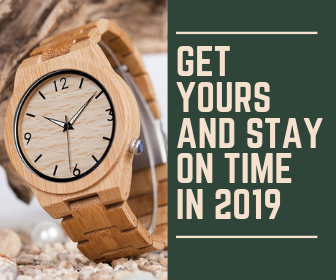 Candidates must be prepared to spend at least 40 minutes completing their forms, provided that they have access to the updated versions of their resumes, along with all of the additional documents they may want to include. We strongly suggest they take the time to write a cover letter as well. This will enable them to mention any relevant details about themselves that they would otherwise be unable to include in the standard form. The cover letter should be no longer than one page and it should be centered on their personal skills, as well as their professional ones. The Union Pacific application form is quite easy to fill out, but it is important that candidates make sure that they follow the instructions listed on the portal so as to convey complete information to the hiring specialists. We recommend candidates that they proofread the information they include in their forms as they fill these out. The Union Pacific application form does not feature a review section, which leaves this up to the candidates. If they opt to use the portal’s data-fill tool, they will save quite a bit of time because the portal will automatically extract the relevant data in their forms and use it to populate the appropriate fields. However, they should take the time to make sure that the data transfer has been done correctly to avoid data inaccuracies. The Union Pacific hiring specialists will analyze the job applications they receive and select the best-suited candidates for the available positions. Then they will contact them to schedule them for the interview process. The number of job meetings that candidates will be asked to sit through depends on the career level and the employment department they have chosen. The Union Pacific hiring managers will provide them with their final answer at the end of the interview process. Candidates preparing for their job meetings should get properly informed about the company’s development and its key achievements. This will help them provide better answers to the Union Pacific hiring specialists and make a good impression. Another aspect they will need to focus on is their appearance. The interview is their opportunity to make a good first impression on the Union Pacific hiring specialists. Their outfits should be in line with the careers they have chosen. Candidates seeking entry-level Union Pacific jobs should choose business casual outfits. Those interviewing for high-level positions, on the other hand, are advised to opt for formal attire because this is the proper etiquette for the event. They should also find the best possible itinerary towards the assigned interview venue and make sure they get to their meetings at least 10 minutes early. Being late for their job meetings might send off the wrong message to the Union Pacific employment specialists, which is why they should avoid this. Preparing their interview answers is a very important step that all candidates should go through. We will provide them with a list of sample questions that have been previously used in Union Pacific interviews. While these may not be the exact questions they will be asked during the job meeting, practicing their answers will make them feel more confident, which could make a difference for their performance. Why have you applied to Union Pacific? What do you know about Union Pacific? What do you think makes you prepared to meet the requirements of this Union Pacific career? What are your long-term career goals and how do you plan to achieve them? If a co-worker would be endangering him/herself, what would you do to prevent this? How important is safety in the work environment to you? What is excellent leadership, in your view? What can you tell me about yourself that is not included in your Union Pacific application?